Pallet furniture is a cheap alternative to buying brand new or used furniture. After all, pallets are basically preassembled planks. Never the less, many warehouses and retail locations are filled with them and can be easily seen by the dumpster waiting to go to the landfill. Luckily everyone can help prevent that and turn that wood into a nifty piece of art that will make one’s peers incredibly jealous. Make all pallets equal in length according to the bed size. On both sides make holes with your handy drill machine. Continue with using four or five relatively thick pallets that are about 2″ wide and long according to bed width as a base to create pallet boards. On both sides of these pallets join long pallets using screws and drill. Use an appropriate amount of screws as one sees fit. Take a couple of pairs of strong heavy duty furniture wheels and drill them to the four corners of the bed frame. Utilize your preferred measuring tool to place them at equal distance from each other. Find your favorite color of paint and apply 2-3 coats (you can also use varnish). This helps the bedframe fight against humidity and other weather effects. 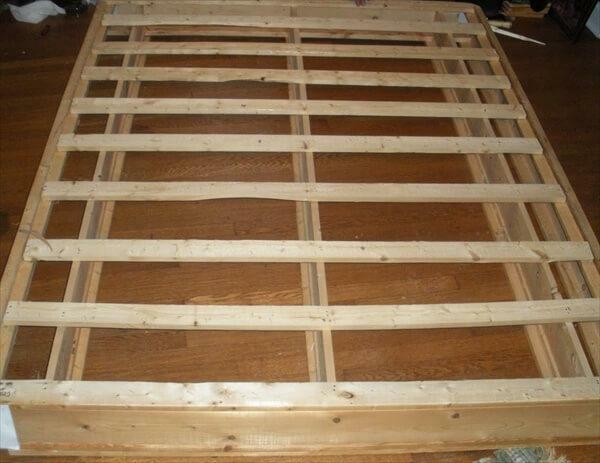 In the final step, place a comfortable mattress on the newly made pallet bed frame and display it with pride. Cover it with your favorite bedsheets and it is complete. Pallets are very cost effective and easy to turn into many different types of furniture and is a great resource for experienced DIYers or those who are looking to start their first project.